AMD recently launched a brand new page dedicated to the upcoming Polaris architecture and posted some pictures teasing the new GPUs. 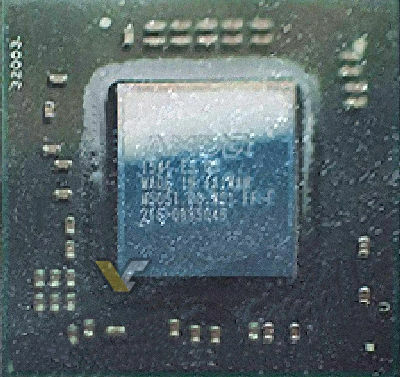 Our collegues over at Videocardz were able to make quick work of it and produce a die shot as well as an estimate of the approximate die size of the flagship Polaris GPU. The size corresponds to the number we heard about three few months ago: 232mm² large die for Polaris 10. 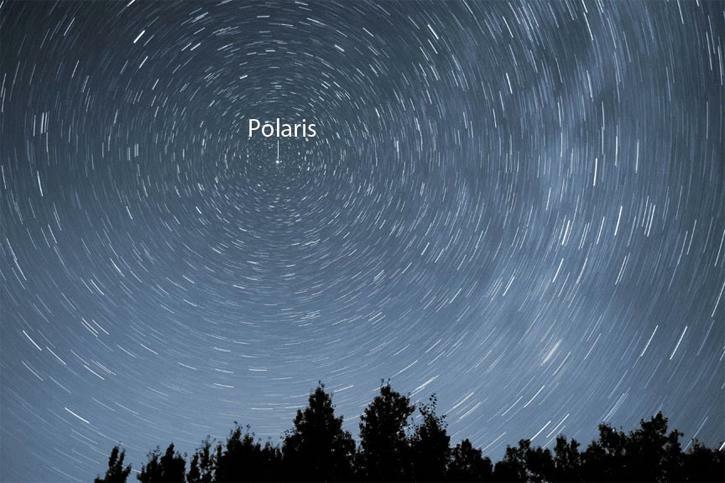 The partial but clear, reconstructed shot is that of Polaris 10 (aka Ellesmere XT). The die appears to be roughly 232mm² which is the exact same number we saw before. This makes it highly unlikely that we are looking at sheer coincidence and probably means that Polaris 10 GPU is, in fact, of that size. We are talking about the Samsung/GloFo 14nm LPP process here, so the size would be optimal in terms of yield and power efficiency. The second die (blurry and full shot) is Polaris 11 (aka Baffin XT). 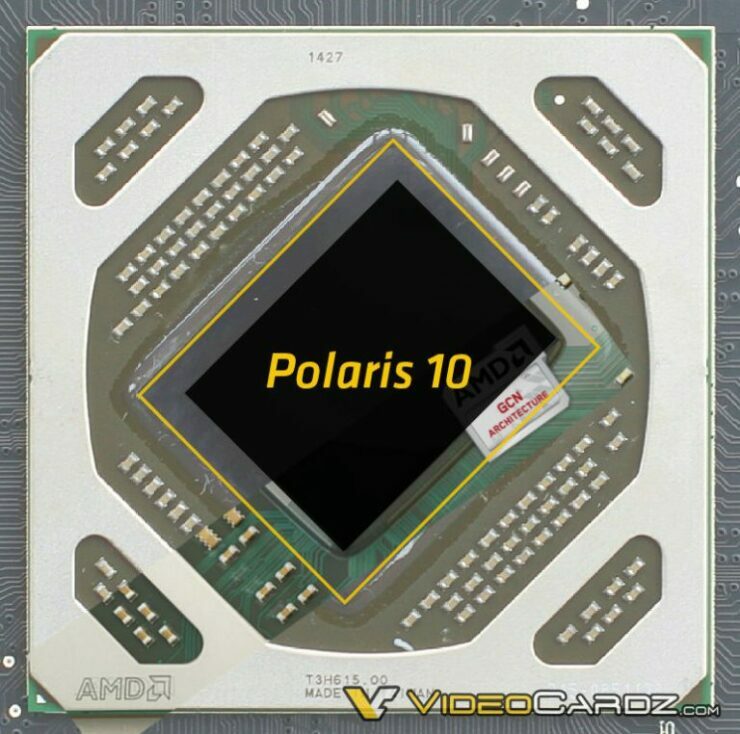 Polaris 11 is the smaller GPU which will be targeting the mobile GPU market and should offer the sweet spot of the Polaris efficiency claim (2.5x increase in perf/watt). The more astute of our readers would notice one inconsistency with this information. A 232mm² does not fit with the positioning of the small Polaris die, which according to our estimates should be around 150mm² and doesn’t fit perfectly with our image of big Polaris which should have been near the 300mm² mark. If you were to take a look at the AMD slide given above and calculate the die shrinks associated with the 14nm jump – the number would be exactly 2.5. 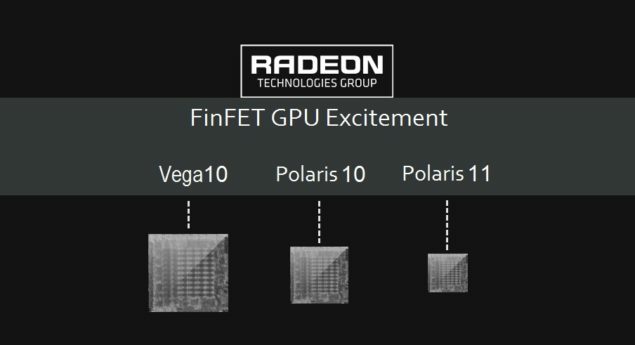 If you remember, Raja Koduri has previously tweeted about Polaris being “2.5 times brighter” in the past – so the number 2.5 times is one AMD is throwing around alot. The performance levels of a 580mm² can be gained by a 232mm² die (at a very rough estimate) if we are talking bout a gain of 2.5 times in performance per watt. This is the theoretical peak, so the real number would probably be lower than this for Polaris 10 accounting for leakage when clocking at high rates. Also, we do not know what kind of power efficiency mix AMD is playing with here so it would be pointless to speculate further about the exact performance levels at this point. *Based on Sisoft and Compubench database leaks.